The latest version includes three new sales reports which offer new way to analyze your sales. 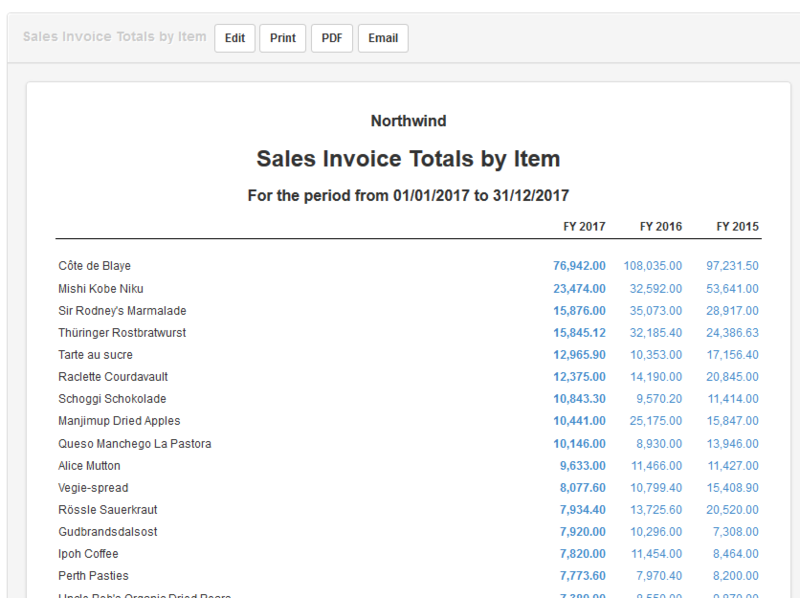 This report will give you invoice totals grouped by customers. This is useful to see which customers are generating the most sales for the specific period of time. The report supports comparative columns so you can compare multiple periods side-by-side (e.g. years, quarters, months, weeks). Similar to previous report, this report will show totals by items you sell. This is useful to see which items are generating the most sales for the specific period of time. Just like the previous report, this one also supports comparative periods. This one is a beast and I’m glad I can finally show you what I’ve been working on because it offers completely new ways how Manager can be customized and bended to exactly fit your business needs. As you already know, you can create custom fields in various places in Manager but until now you couldn’t really use them in any meaningful way. 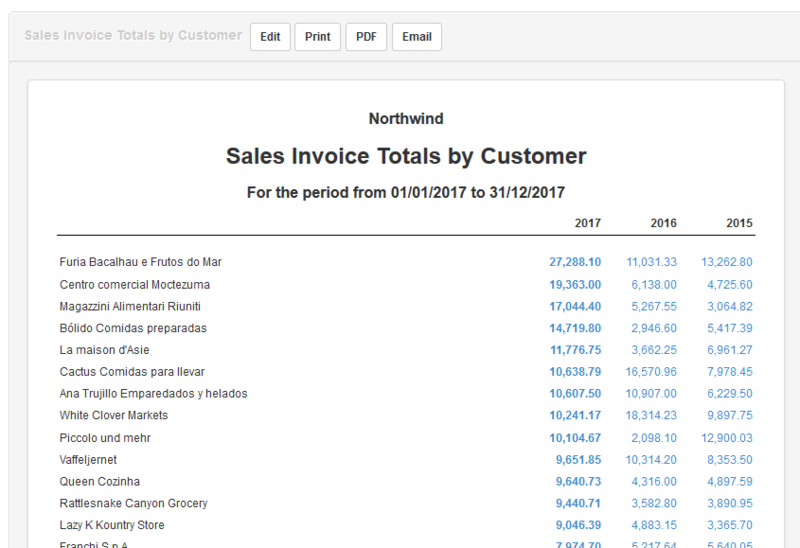 This new report leverages your custom fields to give you new way how you can summarize your sales invoices. Let’s say you have sales associates who are earning commission on generated sales each month. So you need a report which can give you invoice totals by sales associate to calculate their commission. The first step would be to create a custom field on Sales Invoices so every time you create an invoice, you select sales associate who closed the sale. 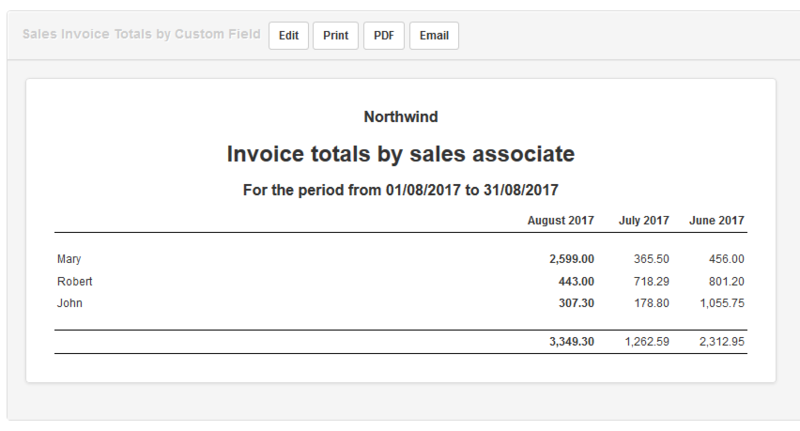 When you are creating the report, set up periods and select custom field by which you want to group the sales invoices. Then the report will show invoice totals by sales associate (not by customer or item as previous reports). However you can go much further than that with this report. This report can also work with custom fields created on individual sales invoice lines, inventory items, non-inventory items and customers too. Let’s say you have thousands of customers and it’s not very useful to see invoice totals by customers because the report is just too long. Perhaps you want to see invoice totals by country. What you do is set up a custom field for Customer and set country on each customer. 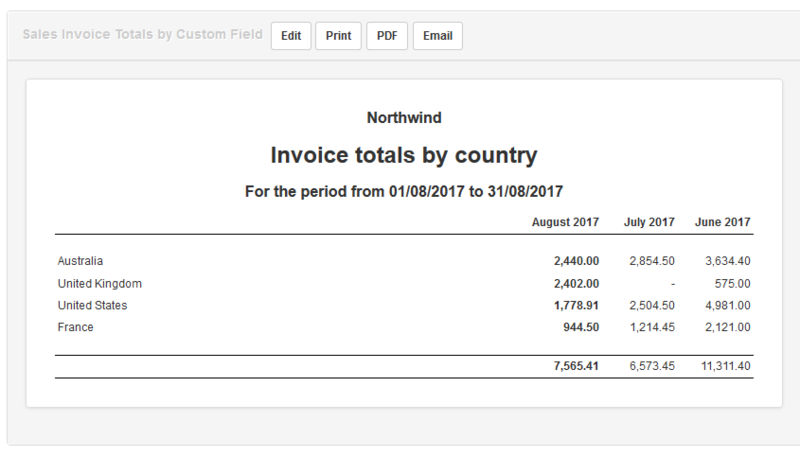 Then you can get invoice totals by country. What if you have thousands of items? It’s probably not very useful to see invoice totals by item… the report would be too long. The best approach would be to create custom field on item (e.g. group, material, type, brand etc.) and then see totals by item custom field. For example, let’s say you are selling many items from a few popular brands. 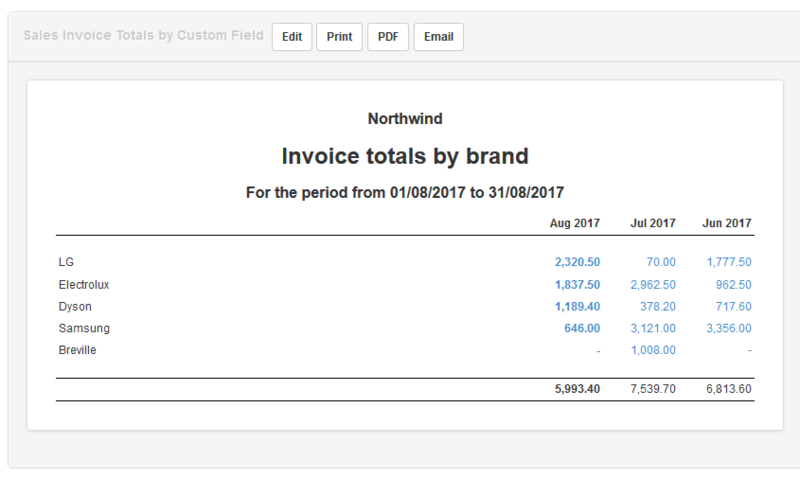 Rather than viewing invoice totals by item, you could view invoice totals by brand. This will make it more compact and much easier to see which brands are selling the best. So these are some basic examples how to use the third report. I’m sure there are a lot more possibilities. These will be very useful. Are there plans to add reports for total sales, picking up both sales by invoice and by receipt? That probably wouldn’t make sense for sales by customer, but reports of sales via receipt by item and custom field could be as or more important than those via sales invoice. @lubos thanks for these very helpful reports. the Sales Invoice Totals by Item should also show the total quantity sold rather than the sales value alone. one more report would have been beneficial to most. it is necessary for a business to identify which customer buys which item the most. a report which shows the item-wise purchase of a customer sorted by the quantity. based on this the business can take decisive actions to boost the least selling item or further increase the sales of the popular item by providing additional discounts. Thank you @lubos. This is something that I have been wanting for a while. I will look into implementing this next week as I would like to see the breakdown of sales. Is it possible to add a report for client profit margin. One of the problems that I am seeing with sales figures is something like this. The sales figure doesn’t really tell much without knowing the cost price as I am assuming that the point of the report is to determine which clients generate the most income or is there some value in knowing the sales totals per client which is largely determined by cost price? I also agree with Tut and Sharpdrivetek’s comments. @dalacor, your example about vacuum cleaners is already handled in even greater detail in the Inventory Profit Margin report. While users may want what they want, I’m not sure how useful it would be to examine profitability by brand, since it is very common for margins to vary across one brand’s range of offerings. I can definitely see the benefit of client margin report, though. Sorry you misunderstood what I was saying. I am aware of the inventory profit margin report in Manager as I have used that from time to time. I was not talking about examining the individual profit margin of each inventory item but more highlighting that I could receive an identical amount from two different clients (one getting 3 dyson vacuum cleaners) and the other getting 22 electrolux vacuum cleaners, but the profit margin is the only meaningful figure. The point that I was making is that I could do £10 000 of sales to two different customers. What does that tell me? Without knowing cost price etc, I can’t see what use it is seeing the total value of sales figure is. It all depends what information is useful to you. I know lots of businesses that want to rank customers by revenue. That doesn’t mean ranking them by margin isn’t also useful. And if you reread my post, you’ll see I agreed with you about that. So I don’t think I misunderstood you. Sweet, thank you @lubos. I second that @tut currently the company I’m working on does not issue sales invoice, they issue receipt can be either by bank or cash transaction. Thanks, would be extremely useful. Thanks very much. The salesperson issue has been my major challenge. Thank you. These are all very helpful. Most appreciated. @lubos This is awesome. Thank you so much. And wondering while taking the comparative report is it possible to select whole tracking codes with one click instead of selecting them one by one ? You cannot create any of these reports by tracking code. What are you referring to? For example, I have 5 fiscal year in manager and I want to see the any invoice report or fiscal statements for each month (balances or statements) of this 5 year. 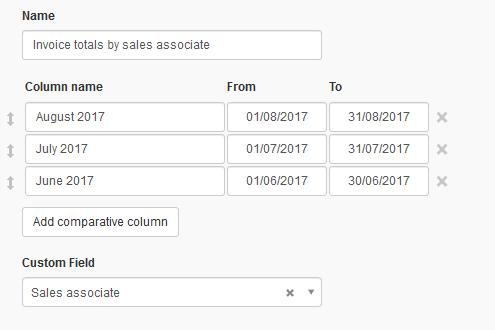 Is it possible to generate the months for the report with one click instead of selecting the desired dates one by one ? For example; On balance sheet I need to compare all months. There can be an option to click something that generating the months for the report? Selecting dates of course should be stay there but these optional things could save the time for users. Your explanation does not illustrate your request. You asked about tracking codes, but your example is about date ranges. So what are you actually asking? If you are asking about a menu of date ranges, I doubt that will be implemented. You want months. But are they calendar months or accounting months that always end the same day of the week? Someone else might want quarters or weeks, or semi-monthly intervals ending on the 15th and the (varying) last day of the month, or biweekly periods ending on Fridays. Where would you stop? Allowing any date range desired by the user seems a more practical solution. My explanations were just an example I’m meaning for all reporting system. Example 1: I need “monthly reports” for General Profit Loss Statement so Manager can creat monthly report according to my desired date ranges. And the same for balance sheet. Example 2 :I want to check all tracking codes’ profit-loss statements on the report but I have 100 tracking codes.It is really hard to select one by one. Manager can creat automatically the codes according to my desired date ranges. What did you label for the tracking codes? That is a lot of tracking. I’d like to bring again to your notice the need to have Reports being exportable to Excel. Its quite a standard especially when further analysis/filtering by the users needs to be done. Please keep up the good work and hope to see you include this in subsequent releases.